As the last of our posts about the legacy of Elizabeth Starr Hawley, we come to two more of her great-grandchildren, Gertrude Boucher Mosher, and Gouverneur Frank Mosher, younger siblings of J. Montgomery Mosher. They are unusual, because both brother and sister were ordained ministers of the church, and both served as missionaries. Gouverneur Frank is unique as the only person raised at St. Paul’s who became a bishop. Gertrude Mosher was born in 1866; she was only 13 when her mother died, and 17 at her father’s death, when she assumed primary responsibilities for housekeeping and care of her two younger brothers. 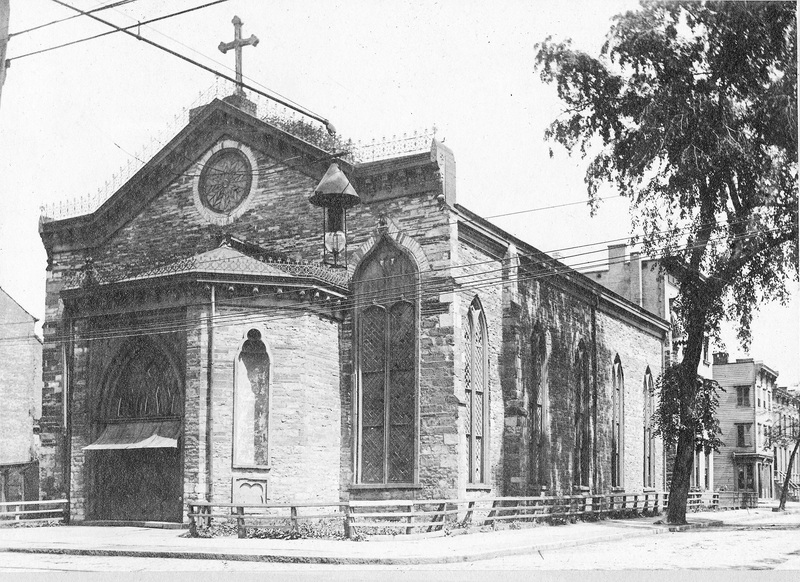 Gertrude was baptized at St. Paul’s in 1867 and confirmed here in 1881. “Gouv” was four years younger than Gertrude, and we are told that she was a parent figure to him. Gouv was also strongly influenced by his mother’s cousin, Sister Julia (born Julia Maria Janes, a granddaughter of Elizabeth Starr Hawley), a member of the Sisterhood of the Holy Child Jesus, who taught in St. Paul’s Sunday School. 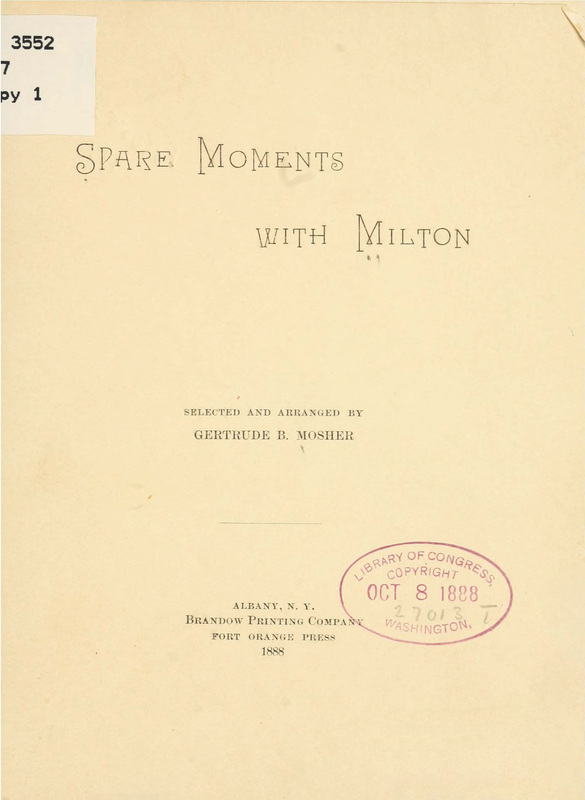 In 1889, Gertrude sailed to Germany, “to continue her musical education.” She was in Germany until July 1891, when she returned to Albany. The next year, she was working as a governess. Gouverneur, meanwhile, had entered Berkeley Divinity School, and while there decided that he was called to be a foreign missionary. Gertrude seems to have decided to join him, because she began study at the New York School for Deaconesses. 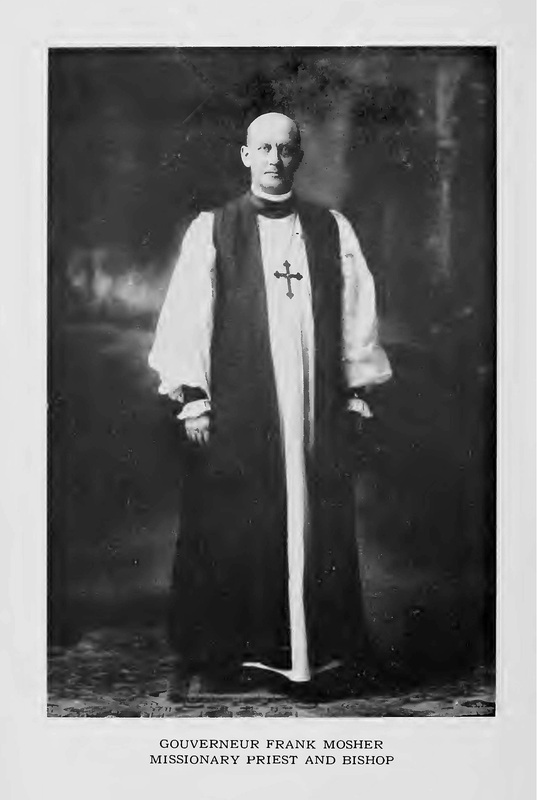 In June 1896 Gouverneur was ordained a deacon, with the backing of St. Paul’s vestry. Later the same year, Gertrude was “set apart” as a deaconess. On October 6, 1896, at a service in the chapel of Church Missions House, in New York City, the congregation bade farewell to Gouverneur and Gertrude, “deacon and deaconess and brother and sister”. The next day they sailed for England, on their way to an assignment in China. Gertrude worked in China from 1896 until 1900, when she returned to the United States and married the Rev. Franklin Knight in a ceremony conducted by St. Paul’s rector, William Prall. She and her husband had four children, and spent the rest of their lives in Massachusetts, Franklin’s home state. We have no further record of Gertrude’s activities, although it seems likely that she continued to contribute in other ways as well. Gouverneur worked in China until 1919, when he was elect missionary bishop of the Philippines. He was consecrated in Shanghai on February 25, 1920. The bishops who participated in Gouverneur Frank Mosher’s consecration as missionary bishop of the Philippines February 25, 1920 are listed below. Unless otherwise noted, they were bishops of the Episcopal Church in the United States. 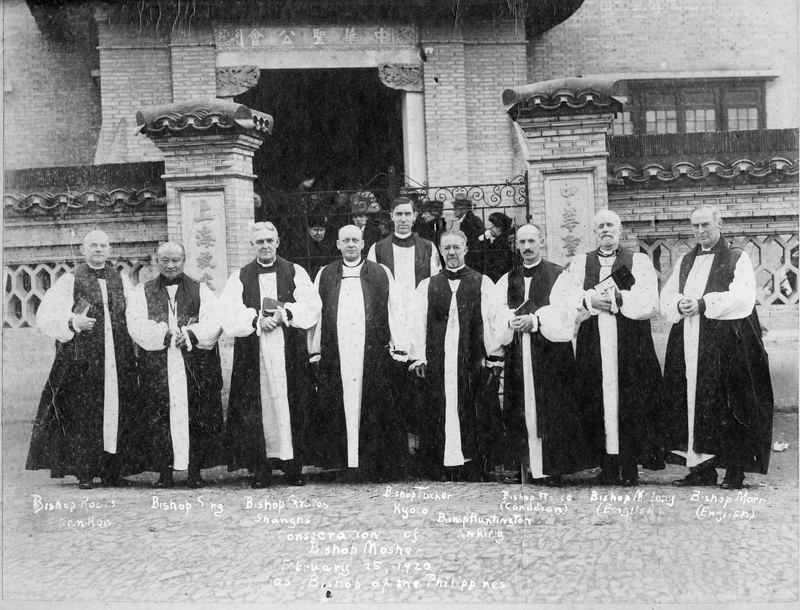 There is no record of a Church of England bishop named Morris in China, so we assume that the label on the man to the far right of the picture is an error. Gouverneur Frank Mosher resigned as bishop in 1940 because of ill health, and returned to the United States. He died in 1941. This entry was posted in Clergy, Hawley, Montgomery and Mosher Families on August 15, 2015 by Paul Nance. In our account of the legacy of Elizabeth Maria Starr Hawley, we come now to her great-grandson, J. Montgomery Mosher. Jesse Montgomery Mosher was born 12 Oct 1864, the son of Jacob Simmons Mosher and Emma Starr Montgomery Mosher, and named for his maternal grandfather. The Moshers were from Coeymans; Jacob and two of his brothers, Cornelius Duel Mosher and Francis Gillette Mosher, were all doctors. Cornelius’s daughter (and little Montie’s childhood playmate) Clelia Duel Mosher, also became a physician, and as a professor of medicine at Stanford was an influential advocate for women’s health. Mosher spent a peripatetic early childhood with frequent moves caused by his father’s career. Both of his parents died when he was in his teens: his mother in 1879 (when he was 15) and his father in 1883 (when he was 19), leaving the family in “straitened circumstances,” and with much of the parenting of younger siblings devolving on his younger sister, Gertrude. 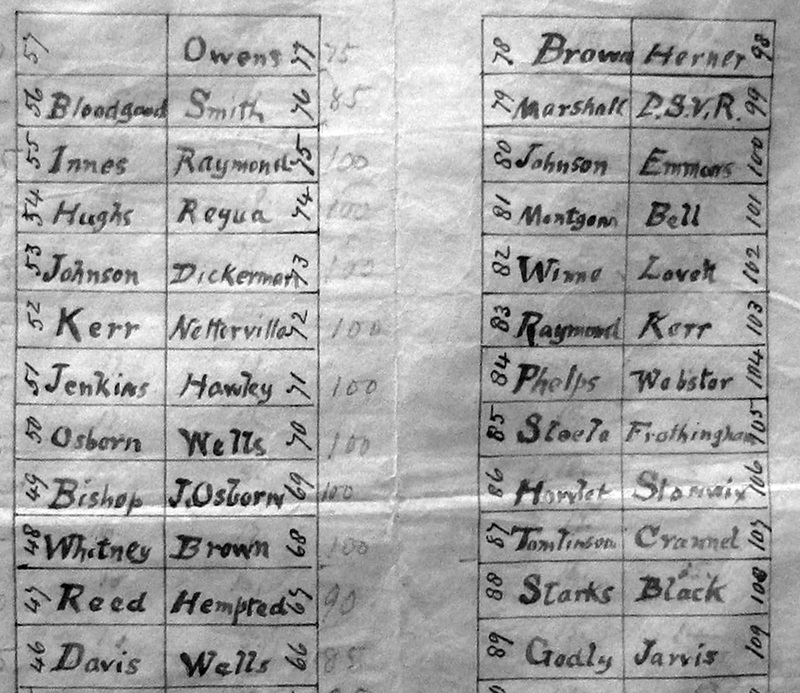 Jesse Montgomery Mosher was baptized at St. Paul’s 19 Nov 1865, and confirmed here on Easter 1882. He attended Albany Academy, and graduated from Union College in 1886 and from Albany Medical School in 1889. During summers while in medical school, he worked in the pharmacy of a mental hospital. 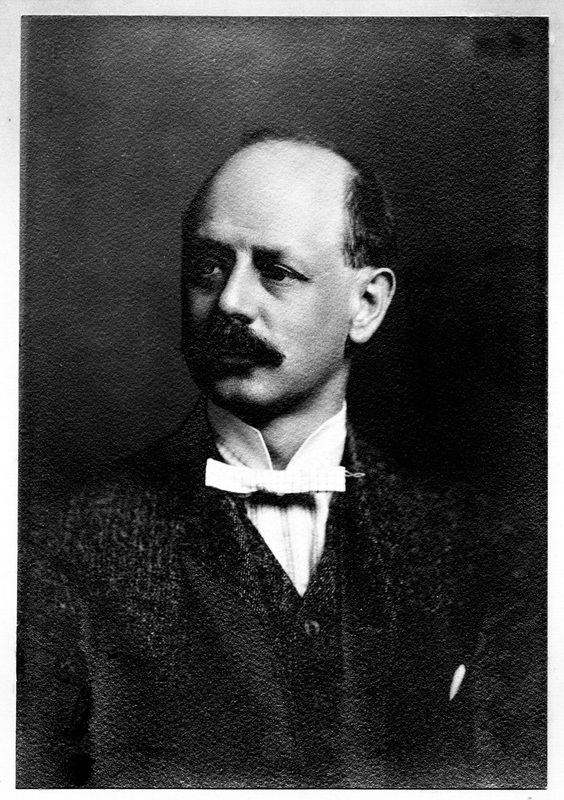 Mosher wrote his thesis on a psychiatric topic and upon graduation worked in mental hospitals until 1895; he took a European tour that year to update his training in other medical specialties, returning to Albany in June 1896. Mosher had to fight many years for a psychiatric ward in the hospital, facing opposition from physicians, administrators, and politicians. He succeeded in 1901, with the establishment of Albany Hospital’s Pavilion F, the first psychiatric ward placed within a general hospital in the world. It was to become a model for psychiatric wards in other cities in the United States, and later around the globe. 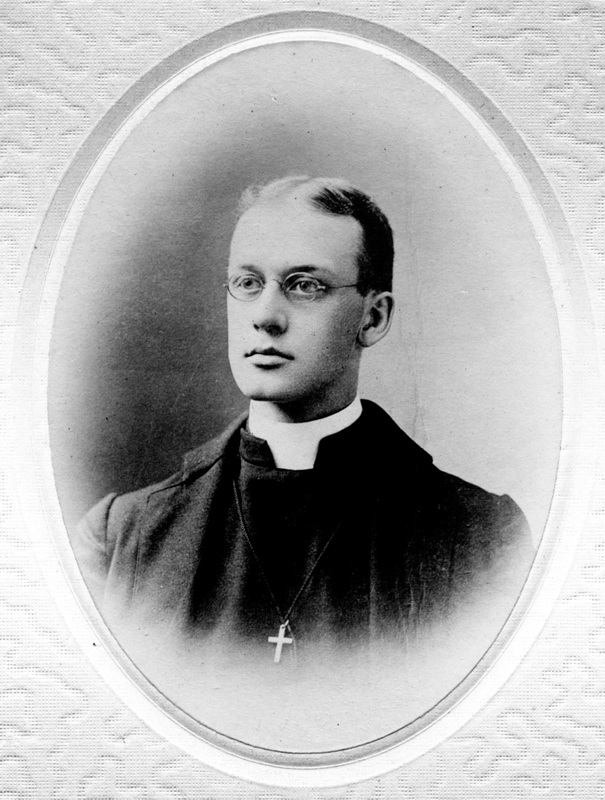 Like his father, J. Montgomery Mosher was elected a vestryman at St. Paul’s, and served from 1906 until his death in 1922. 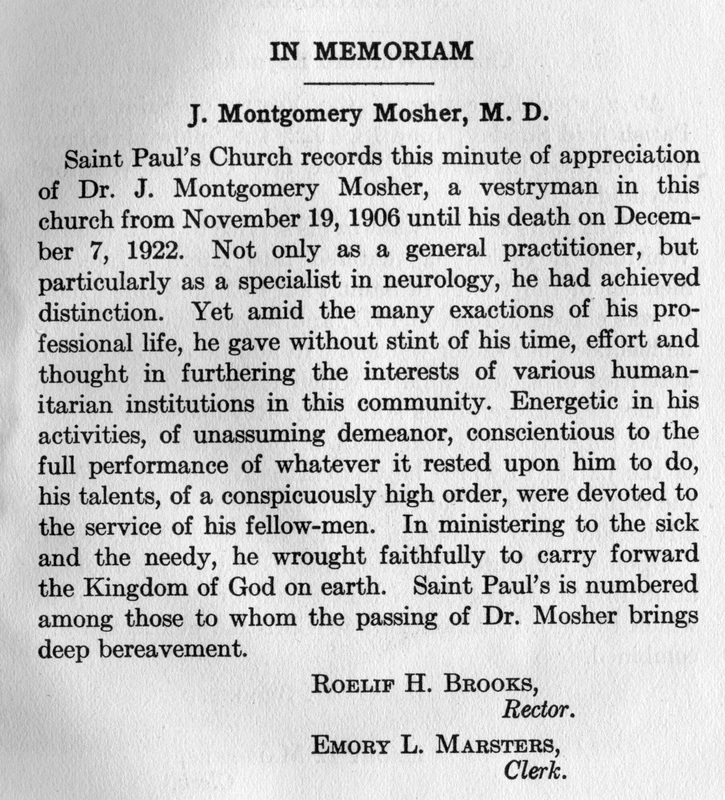 St. Paul’s Year Book for that year contains an unusually warm tribute to Mosher, praising both his professional dedication and his commitment to community organizations, including St. Paul’s, which his great-grandmother had joined more than ninety years earlier. We have now reached the fourth generation of the legacy of our Mrs. Betsy Hawley. The next post will primarily concern J. Montgomery Mosher’s younger siblings, Gertrude Mosher Knight and Gouverneur Frank Mosher, with an appearance by another of Betsy’s descendants. This entry was posted in Hawley, Montgomery and Mosher Families, Vestry on August 3, 2015 by Paul Nance. In a previous post, we began looking at the legacy of Elizabeth Maria Starr Hawley, who became a member of St. Paul’s Church in 1831. She and and all four of her children were active members of the young congregation. 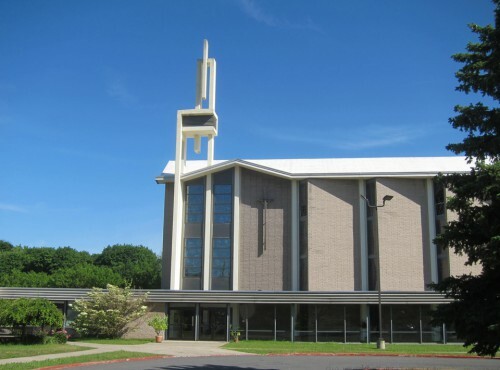 This time, we follow her descendants to the next generation: the children of her daughters Lydia Amelia Hawley and Mary Ann Hawley , both of whom, as we have seen, were communicants of St. Paul’s. Mary Ann Hawley (1817 — 1911) married William Janes (born 1906) in St. Paul’s Church on April 5, 1843. Of their three children, Julia Maria Janes (1848 — 1933), who joined the Sisterhood of the Holy Child Jesus as Sister Julia will became important to our story in relation to one of her younger cousins. Our main story, however, follows the descendants of Lydia Amelia Hawley (1814 — 1880), who married Jesse H. Montgomery (1810 — 1840). The couple had two children, Emma Starr and Lydia Amelia. Both daughter were communicants of St. Paul’s by 1858 and both were married at St. Paul’s in the mid-1860’s. Emma married a young physician from Coeymans, Jacob Simmons Mosher, and it is their descendants who will fill much of the rest of our story. When the young couple was married at St. Paul’s in December 1863, Emma might have hoped for the quiet life of a physician’s and academic’s wife in Albany, but, with the Civil War still raging, this was not to be. The next year, Jack was appointed volunteer surgeon in the Army of the Potomac and sent to Virginia. In June 1865, Emma and their first child were living with her mother. Even the end of the war did not make things easier. Jack was appointed Assistant Medical Director of New York, and assigned to Washington, D.C. The family’s longest stay in Albany was from 1869 until 1873, when Jack served as Superintendent of a hospital for disabled soldiers here. During this period, Mosher was also a vestryman of St. Paul’s Church. This respite ended when he was named Deputy Health and Executive Officer for the Port of New York. The family lived in New York City from 1873 until they returned to Albany for good in 1876. Through all these moves, Emma retained her connection to St. Paul’s: three of her four children were baptized at St. Paul’s . But the constant moves and child-bearing took their toll; the next entry in our records is that of the death of Emma Starr Montgomery Mosher on June 28, 1879, when she and her newborn infant were buried from St. Paul’s. 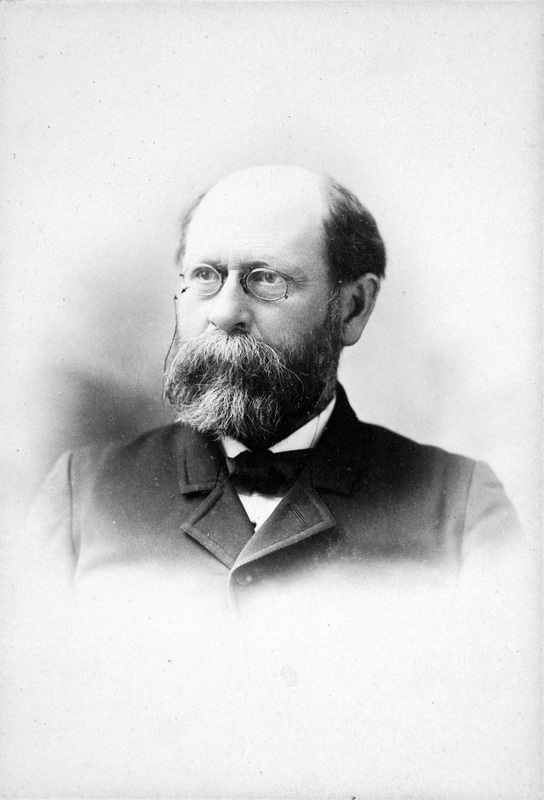 Jacob Simmons Mosher finished a distinguished career as physician, teacher and administrator in Albany. 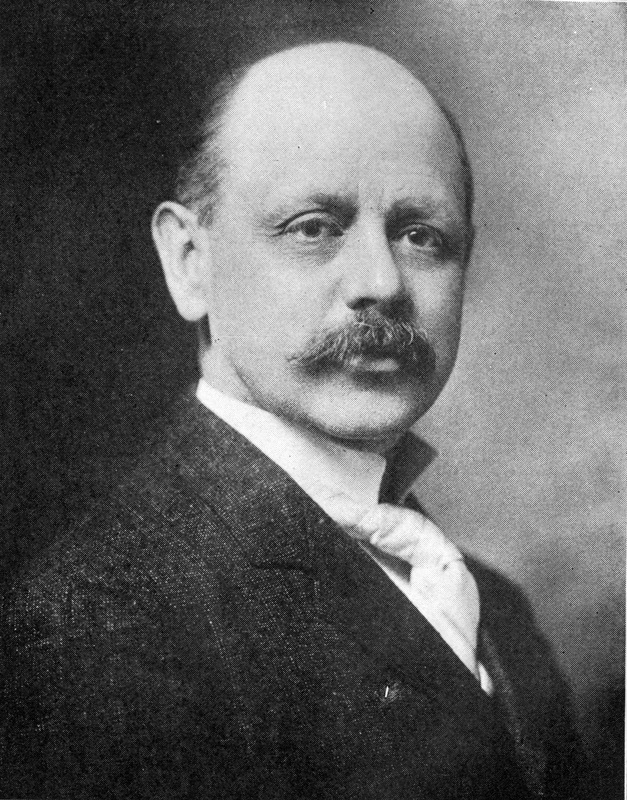 He was among the earliest faculty of the Albany Medical College and one of the founders of the Albany School of Pharmacy, where he was also professor. He died in 1883 and was buried from St. Paul’s. In the next posts, we will follow the lives of three of Emma and Jack’s children, each of whom made important contributions locally, nationally and internationally, extending the legacy of our Mrs. Betsy Hawley. This entry was posted in Hawley, Montgomery and Mosher Families, Vestry on July 15, 2015 by Paul Nance.